Knowledge of short- and longer-term repeatability of lung function in health and disease is essential to determine bronchodilator reversibility thresholds and to recognise if changes in lung function represent disease progression, therapeutic intervention or normal variability. Multiple-breath washout indices (lung clearance index, conductive ventilation inhomogeneity (Scond)) and specific airway resistance (sRaw) were measured in healthy children and stable wheezers. Measurements were performed at baseline and after 20 min without intervention to assess repeatability and determine bronchodilator reversibility thresholds. Bronchodilator reversibility was assessed by repeating baseline measurements 20 min after inhaled salbutamol. 28 healthy controls, mean±sd age 6.1±0.7 years and 62 wheezers 5.4±0.6 years were tested. Baseline variability in multiple-breath washout indices and sRaw was not significantly different between wheezers and healthy controls. Significant bronchodilator reversibility was only observed in wheezers for Scond (16%), but in both wheezers (37%) and healthy controls (20%) for sRaw. Some wheezers and healthy controls demonstrated increases in multiple-breath washout indices post-bronchodilator. Lung clearance index and sRaw demonstrate low baseline variability in healthy and diseased subjects. Neither multiple-breath washout indices nor sRaw are ideal for assessing bronchodilator reversibility in young children with stable wheeze. These findings will help to interpret the effect of therapeutic interventions in children with respiratory diseases. Multiple-breath washout (MBW) and plethysmographic specific airway resistance (sRaw) are popular techniques for measuring lung function in young children [1, 2]. The lung clearance index (LCI), derived from MBW, is being increasingly recommended as a sensitive outcome measure to assess the efficacy of early therapeutic intervention in children with cystic fibrosis [3, 4]. However, the short-term variability of repeated measurements for MBW indices and sRaw in this age group is unknown. It is essential to know the short- and longer-term variability of lung function indices in health and disease to establish thresholds for bronchodilator reversibility (BDR) and to determine whether changes in lung function are due to disease progression, therapeutic intervention or normal fluctuation. Short-term repeatability reflects the variability of the measuring instrument and the biological variability in health and disease . Only change greater than the short-term repeatability can be attributed to disease progression or a pharmacological intervention, such as bronchodilator administration. Although BDR assessment is increasingly applied to assess the reversible component of airways obstruction in young children with wheeze, there is currently no consensus on what constitutes significant BDR with MBW indices and sRaw measurements . The main aim of the present study was to establish short-term repeatability and determine thresholds for BDR for MBW indices and sRaw in healthy children and clinically stable children with doctor-diagnosed recurrent wheeze aged 4–6 years. A secondary aim was to determine longer-term repeatability by determining the between-visit variability of baseline measurements. Some of the results in this study have been previously reported . This prospective cross-sectional study was conducted at University College London (UCL) Institute of Child Health (ICH), London, UK, from October 2006 to August 2009. The Joint UCL/UCLH Ethics Committees approved the study (reference number 05/Q0505/76). Parents gave informed written consent for their child to participate. Healthy children and children with doctor-diagnosed recurrent wheeze aged 4–6 years were recruited to the study as described previously [6–8]. Children underwent either the repeatability or the BDR protocol, in random order on two separate occasions. All children had anthropometry measured and a clinical respiratory examination to ensure the absence of acute wheeze or upper respiratory tract infections during the two test visits to the respiratory laboratory. For assessment of short-term repeatability, MBW indices (LCI, conductive airway inhomogeneity (Scond), acinar airway inhomogeneity (Sacin) and sRaw) were measured and repeated after 20 min, as described previously . BDR was assessed by measuring MBW indices and sRaw at baseline and 20 min after administration of inhaled salbutamol 200 μg via a spacer device. In wheezers, short- and long-acting bronchodilators were withdrawn for 8 h and 24 h, respectively, at the time of the test. The baseline MBW and sRaw measurements on the two different test occasions were used to assess the longer-term repeatability of these indices. MBW was performed as previously described in young children [6, 9]. Sulfur hexafluoride was the inert marker gas used for calculation of gas mixing indices reported in this study, as measured by a respiratory mass spectrometer (AMIS 2000; Innovision A/S, Odense, Denmark). LCI was calculated by dividing the cumulative expired volume by the functional residual capacity; Scond and Sacin were estimated by calculating phase III slopes, as described previously . The mean LCI, Scond and Sacin values from three technically acceptable washouts are reported. sRaw was measured with a constant volume body plethysmograph (Master Screen Body Plethysmograph, version 5.02; VIASYS Healthcare, Hochberg, Germany). Children sat alone in the plethysmograph wearing a nose-clip. They were guided to breathe gently at a rate of 30–45 breaths per minute through the mouthpiece; three trials of 10 loops each were recorded. Results were excluded if fewer than five technically acceptable loops were obtained. The median total sRaw from the three trials are reported . The standard deviation of the within-child differences between two tests in the absence of any intervention on the same occasion was used to calculate the coefficient of repeatability (CoR=1.96×sd) in healthy children and those with wheeze. Bland–Altman limits of agreement (mean difference±CoR) were estimated and the lower limits used to determine thresholds for reversibility in health and disease . Paired t-tests were used to compare the differences between repeated baseline measurements, between pre- and post-bronchodilator measurements and also, for children who had both sets of measurements, the within-child differences between change during BDR and repeatability in absence of intervention. These tests were performed separately for the healthy controls and wheezers. Two sample t-tests were used to compare the differences between healthy controls and wheezers. The within-child changes were analysed within multilevel models with factors for repeatability/BDR, healthy control/wheezer and the interaction between these. These models utilised the within-child pairing of measurements where they existed, but also allowed all available measures to contribute to the estimates of differences attributable to BDR or wheeze. Furthermore, the interaction terms provided formal comparison of whether any BDR/repeatability differences were significantly different between healthy controls and wheezers. The limits of agreement, all differences and model coefficients are presented with 95% confidence intervals to illustrate the precision of our estimates (determined by the sample size) . The level of significance was set at p<0.05. Data analyses were performed using SPSS version 15 (SPSS Inc., Chicago, IL, USA), MLwiN version 2.20 (Centre for Multilevel Modelling, University of Bristol, Bristol, UK) and GraphPad Prism version 5 (GraphPad Software, San Diego, CA, USA). The graphs were created using GraphPad. When we first set out to conduct the study, there were no studies in either preschool or older children that had determined the repeatability of MBW indices in health or disease. The sample size of the current study was based on the primary outcome, i.e. LCI and was informed by published data from our centre in healthy preschool children (mean age 4.1 years), in whom mean±sd was 6.8±0.4 for LCI . It was planned to recruit at least 30 wheezy children and 30 healthy controls to establish BDR thresholds. This would allow the limits of agreement to be estimated to within ±0.62 standard deviations and to detect differences of 0.85 standard deviations with 90% power at the 5% significance level. 62 children with recurrent wheeze (mean±sd age 5.4±0.6 years; 39 males) and 28 healthy controls (6.1±sd 0.7 years, 13 males) were recruited. Of those recruited, repeatability of lung function was assessed in 30 wheezers and 18 healthy controls (table 1), and BDR in 62 wheezers and 26 healthy controls (table 2). Both sets of repeatability and BDR measurements were available in 30 wheezers and 16 healthy controls (table 3). The interval between BDR and repeatability measurements for wheezers was median (interquartile range) 5.3 (2.2–7.8) months and for healthy controls 9 (2–11) months. The short-term variability of repeat lung function measurements in wheezers and healthy controls is shown in table 1. There were no significant differences between the two sets of measurements in either group for any of the lung function outcomes (table 1) (fig. 1), nor were there any differences in change between the two sets of measurements according to health status (table 1). Although the coefficient of repeatability was similar between wheezers and healthy controls for LCI and sRaw, it was insignificantly larger for Scond and Sacin in wheezers compared with healthy controls (tables 1 and 3) (fig. 1). Bland–Altman plots of lung function measurements in a, c, e and g) wheezers and b, d, f and h) healthy controls obtained during the repeatability protocol. The difference between tests is plotted against the average value for the two tests. –––––: mean difference between two sets of measurements; ------: 95% limits of agreement with precision estimates (shading). The outlier with a baseline lung clearance index (LCI) of 11.86 and specific airway resistance (sRaw) of 2.57 was the same child. This particular child was a multiple-trigger wheezer with severe atopy, a strong family history and had five acute exacerbations in the 6 months before being tested. T1: test 1; T2: test 2; Scond: conductive airway inhomogeneity; Sacin: acinar airways inhomogeneity. The longer-term variability of repeat lung function measurements in wheezers and healthy controls is shown in online supplementary table S1. 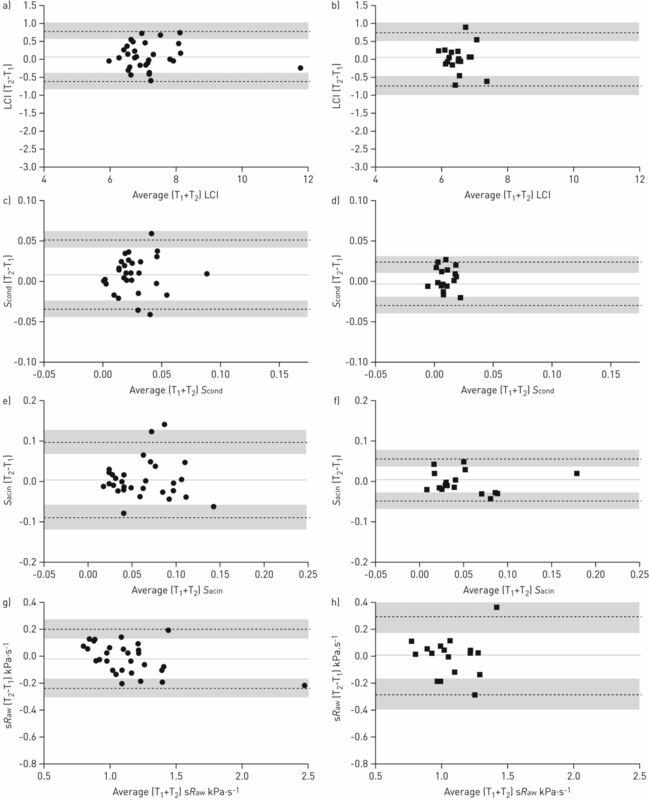 Other than a significant variability in Scond measurements in wheezers, there were no significant differences between the two sets of measurements in either group for the lung function indices or any differences in change between the two sets of measurements according to health status (table S1). Responses to bronchodilator in wheezers and healthy controls are shown in table 2. Wheezers demonstrated a significant decrease in post-bronchodilator Scond and sRaw (table 2), with 10 (16%) and 23 (37%) wheezers demonstrating BDR larger than the determined thresholds of reversibility for Scond and sRaw, respectively (fig. 2). Healthy controls also showed a significant decrease in post-bronchodilator sRaw (table 2), with four (20%) children demonstrating BDR larger than the determined threshold of reversibility (fig. 2). The wheezers showed a strong correlation between the baseline values and BDR for all MBW indices and sRaw: Spearman's rho for LCI was 0.64 (p<0.005), Scond 0.51 (p<0.005), Sacin 0.426 (p<0.005) and sRaw 0.737 (p<0.005). A statistically significant increase in post-bronchodilator LCI was seen in the healthy controls (table 2), with the increase in one child being above the upper 95% limit of agreement of 0.75 for healthy controls (fig. 2). Although there was no significant group change among the wheezers, an increase in LCI above the upper 95% limit of agreement (0.78 for wheezers) occurred in six (10%) wheezers (fig. 2). The healthy controls showed a strong correlation between the baseline values and BDR for LCI and sRaw, but not for Scond and Sacin: Spearman's rho for LCI was 0.55 (p<0.05), Scond -0.09 (p=0.72), Sacin 0.01 (p<0.98) and sRaw 0.76 (p<0.005). Relationship between baseline lung function measurements and absolute changes in postbronchodilator, measurements in a, c, e and g) wheezers and b, d, f and h) healthy controls. ------: thresholds for reversibility with the precision estimates (shading), as shown in table 1; ––––––: upper 95% limit of agreement for normal variability. LCI: lung clearance index; Scond: conductive airway inhomogeneity; Sacin: acinar airways inhomogeneity; sRaw: specific airway resistance. The data in table 3 are restricted to the 46 children who had complete sets of data (i.e. those with both repeatability and BDR assessments). As when examining the whole group, a significant post-BDR reduction in mean sRaw was seen in both wheezers and healthy controls with paired measurements. Similarly, a significant paradoxical increase in LCI was seen among the healthy controls but not wheezers. The difference between repeatability and BDR measurements did not, however, differ significantly between wheezers and controls for any indices (table 3). These data were further analysed by multilevel modelling. The multilevel regression model combined the analyses shown in tables 1–3] and utilised all available measurements in each estimate, hence allowing greater precision. The results were similar to those above and therefore are not presented here in detail. In summary, there were no significant differences between repeated measurements for either wheezers or healthy controls, or in the repeatability between each of these groups. The only significant overall difference observed post-BDR was with respect to sRaw, for which there was, on average, a median (range) reduction of 0.141 (0.057–0.225) kPa·s−1 when compared with repeatability data (p=0.001), but this did not differ significantly between wheezers and controls (p=0.63). This is the first study to determine the normal variability of MBW indices and sRaw in health and disease, and to establish thresholds for significant BDR in young children. We found that the coefficients of repeatability and the thresholds for reversibility for MBW indices and sRaw were not materially different between healthy controls and stable wheezers. Significant BDR was seen only in some of the indices measured, i.e. wheezers demonstrated significant BDR for Scond, and both wheezers and controls demonstrated significant BDR for sRaw. The good short- and longer-term repeatability and similarity in variability of repeat measures in wheezers and healthy controls for LCI suggests that variability of LCI is unaffected by health status during periods of clinical stability in wheezers. Although repeat measurements of Scond and Sacin were not significantly different in either wheezers or healthy controls, the wide 95% confidence intervals, particularly in wheezers, suggest that these indices are influenced more than LCI by the uneven gas distribution. The large baseline variability of these indices increases the threshold for determining significant BDR and reduces their capacity to discriminate between health and disease in terms of bronchial responsiveness. A number of physiological factors, such as lung volume, inhomogeneous airway closure and changing tidal volume, affect ventilation distribution, particularly those indices derived from phase III slope analysis [13–15]. Moreover, in obstructive airways disease, the relationship between airways obstruction and ventilation inhomogeneity is heterogeneous, thus varying from one subject to another . It is difficult to examine the effects of single variables on gas mixing as the variability between wheezers and healthy subjects is probably multifactorial. It is speculated that this relates to intersubject differences in site and extent of airways obstruction leading to differences in regional and interlobar distribution of time constants . Despite LCI being endorsed as a suitable tool with which to assess early intervention strategies in children with cystic fibrosis, there is a paucity of data on repeatability of MBW indices in children. Repeatability of MBW indices (LCI, Scond and Sacin) in a small group of adults with and without asthma showed good repeatability in both groups, albeit with a higher variability of Scond in the asthmatics compared to healthy controls, which is similar to our data . Similarly, Fuchs et al. showed low variability in repeat LCI measurements using the side-stream ultrasonic flow sensor in healthy subjects aged 5–20 years. The hardware and software for MBW used in this study is identical to that used in the majority of published research studies in children, and at the time of our data collection, MBW by mass spectrometry was considered the gold standard. We are aware that two commercial nitrogen washout MBW devices are now available and that validation studies comparing these devices with mass spectrometer based systems are on-going. If the validations are successful, the findings of this study would be potentially applicable to these other devices. There was a low variability in repeat sRaw measurements in both wheezers and healthy controls. These results are in keeping with those of Klug and Bisgaard , who showed good short-term repeatability of sRaw with an intraclass correlation coefficient of 0.84 in healthy children aged 2–7 years. There are no studies assessing the short-term repeatability of sRaw in young wheezers or in older children with asthma. The applicability of our results is limited by the smaller number of healthy controls studied compared with wheezers. A further limitation is that the range of within-subject variability varied between the selected indices of airway function and the sample sizes obtained were sometimes smaller than the planned number of 30, with the smallest group comprising 16. Hence the confidence intervals for the thresholds were wider than expected. In addition, the power to detect the specified difference (0.85 significant difference) was reduced to 77% although differences of ≥1 significant difference were detected with 90% power, with the current sample size. Considering the age range targeted, it was logistically difficult to bring back the same children on two separate occasions, when they were free from upper respiratory tract infections for at least 3 weeks, within the time restraints of the study. Nonetheless, increased confidence in the results was obtained by undertaking multilevel modelling so that all available measurements could be taken into account; the results of this analysis supporting the findings from the multiple tests undertaken. The repeatability data facilitates better interpretation of BDR. A further strength is that the assessment of short-term repeatability was performed in healthy young children and wheezers of similar ages, on the same laboratory visit, by the same personnel over a short period of time, thereby eliminating operator variability. Among the MBW indices, although a statistically significant BDR in wheezers was seen only for Scond, only 16% demonstrated significant BDR larger than the determined threshold. Furthermore, the large baseline variability in repeat measures of Scond, and the time required to obtain these measurements  does not make this a robust index to assess BDR. It is of potential interest that slightly more individuals than expected showed an increase in post-bronchodilator MBW indices outside the determined BDR thresholds. It has been suggested that inhaled bronchodilator aerosols have a primary effect on low-resistance pathways and are thus mainly delivered to well-ventilated lung units [21, 22]. This distribution of the aerosol would result in further increase of ventilation inhomogeneity, even though airway resistance might fall . These results suggest that bronchodilator administration may have favourable or unfavourable effects on gas mixing, making MBW an unsuitable technique to assess BDR. Significant BDR for sRaw was seen in both wheezers and healthy controls, undermining the discriminating capacity of this technique in young children. Several studies have shown that that changes in lung function after bronchodilator administration does not significantly differ between healthy and clinically stable asthmatic children in the younger ages [23, 24]. It is known that BDR is significantly influenced by the degree of baseline impairment in lung function , and similarly the wheezers with poorer lung function in our study demonstrated greater BDR in all the indices. We also found this relationship in healthy controls, except for the slope indices. The main limitation of BDR assessment in this study is that the effect of bronchodilator was not compared with placebo to eliminate effects of using the inhaler and spacer and any possible effects of the propellant. It could be argued that 200 μg of salbutamol is insufficient to fully reverse the baseline inefficient gas mixing in wheezers. Ideally, dose–response curves should have been used, but this is not feasible in young children. Nevertheless, a number of studies in children and adults with stable asthma have demonstrated up to 20% improvement in forced expiratory flow volumes on spirometry with salbutamol doses of 100 μg  and 200 μg [27, 28]. Besides, studies that have investigated the effect of bronchodilation on sRaw in young children have demonstrated reversibility with 500 μg of inhaled terbutaline (equivalent to 200 μg of salbutamol) [25, 29]. However, in the absence of dose–response curves, it is not possible to exclude the possibility that the degree of reversibility has been underestimated. Allowing for these limitations, our study describes novel data on the effects of bronchodilator on MBW indices and sRaw in young healthy children and those with wheeze. In conclusion, sRaw and LCI have low variability in health and disease, but Scond and Sacin show higher baseline variability in disease compared with health. MBW indices are not ideal to assess BDR because of large baseline variability of repeat measurements particularly in wheezers and unpredictability of gas mixing and distribution after bronchodilator administration. The capacity of sRaw to discriminate between healthy young children and children with stable wheeze according to BDR is doubtful because of the large overlap in response between the two groups. These findings will inform choice of outcomes when attempting to assess BDR in young children and help interpret the effect of therapeutic interventions in children with respiratory diseases. The authors thank Per Gustafsson (Dept of Paediatrics, Central Hospital, Skovde, and Sahlgrenska Academy, University of Gothenburg, Gothenburg Sweden) for his on-going support with the MBW system and all the parents and children who participated in the study. Support statement: This study was supported by Asthma UK (06/037), the European Respiratory Society (LTRF 06/47) and Smiths Medical UK. A. Bush was supported by the NIHR Respiratory Disease Biomedical Research Unit at the Royal Brompton and Harefield NHS Foundation Trust and Imperial College, London.
. Pulmonary function tests in infants and preschool children. In: Wilmott RW, Boat TF, Bush A, et al., eds. Kendig's Disorders of the Respiratory Tract in Children. 8th Edn. Philadelphia, Elsevier, 2012; pp. 169–210.
. Hypertonic saline improves the LCI in paediatric patients with CF with normal lung function. Thorax 2010; 65: 379–383.
. The effect of dornase alfa on ventilation inhomogeneity in patients with cystic fibrosis. Eur Respir J 2011; 37: 806–812.
. Interrupter resistance short-term repeatability and bronchodilator response in preschool children. Respir Med 2007; 101: 2482–2487.
. 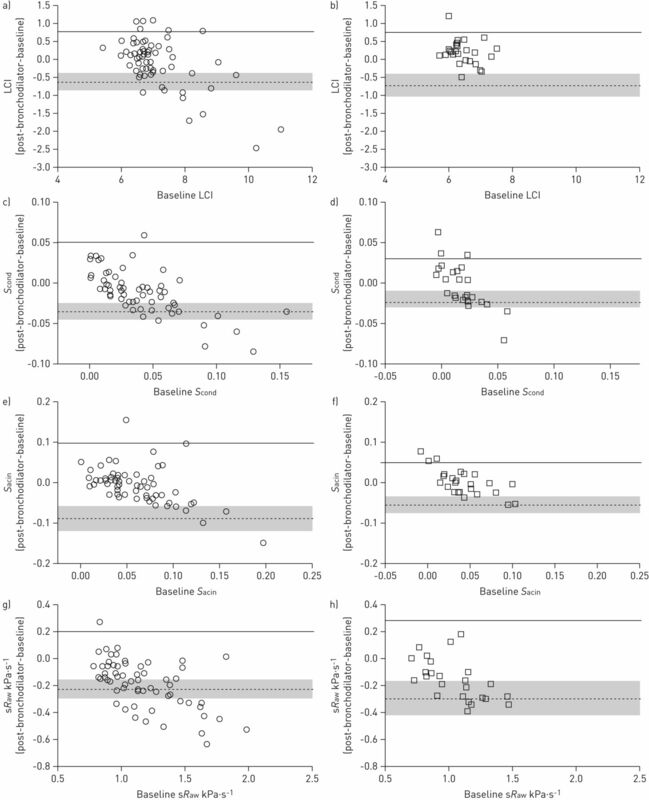 Relationship between past airway pathology and current lung function in preschool wheezers. Eur Respir J 2011; 38: 1431–1436.
. Ethnic differences in fraction of exhaled nitric oxide and lung function in healthy young children. Chest 2011; 140: 1325–1331.
. Reference equations for specific airway resistance in children: the Asthma UK initiative. Eur Respir J 2010; 36: 622–629.
. Effect of airway closure on ventilation distribution. J Appl Physiol 1989; 66: 2511–2515.
. Effect of lung volume on ventilation distribution. J Appl Physiol 1989; 66: 2502–2510.
. Convection- and diffusion-dependent ventilation maldistribution in normal subjects. J Appl Physiol 1985; 59: 838–846.
. Relationship between maldistribution of ventilation and airways obstruction in children with asthma. Respir Physiol 1987; 69: 287–297.
. Ventilation heterogeneity is a major determinant of airway hyperresponsiveness in asthma, independent of airway inflammation. Thorax 2007; 62: 684–689.
. Specific airway resistance, interrupter resistance, and respiratory impedance in healthy children aged 2–7 years. Pediatr Pulmonol 1998; 25: 322–331.
. Conductive and acinar lung-zone contributions to ventilation inhomogeneity in COPD. Am J Respir Crit Care Med 1998; 157: 1573–1577.
. Effects of an inhaled bronchodilator on gas distribution and over-all ventilatory efficiency in patients with chronic obstructive pulmonary disease. Am J Med 1976; 61: 74–84.
. Bronchodilator response in 3–6.5 years old healthy and stable asthmatic children. Eur Respir J 1998; 12: 438–443.
. A comparison of the bronchodilatory effect of 50 and 100 microg salbutamol via Turbuhaler and 100 microg salbutamol via pressurized metered dose inhaler in children with stable asthma. Int J Pharm 1999; 180: 169–175.
. Differences in bronchodilating potency of salbutamol in Turbuhaler as compared with a pressurized metered-dose inhaler formulation in patients with reversible airway obstruction. Eur Respir J 1997; 10: 2474–2478.
. Albuterol treatment for children with asthma: a comparison of inhaled powder and aerosol. J Allergy Clin Immunol 1989; 83: 697–702. British Thoracic Society Scottish Intercollegiate Guidelines Network. British Guideline on the Management of Asthma. Thorax 2008; 63: Suppl. 4, iv1–iv121.